(Kind of rude) Why isn't she allowed to have secrets? Because you can't keep one to save your life? (Strong but in character) Mars Star Power! (Pause) Burning Mandala! (Happy and excited) Sailor Moon! You did it! You saved the planet! 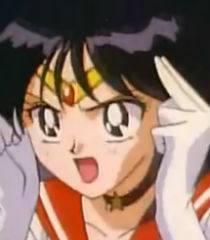 (Suddenly devastated and angry) Sailor Moon? Sailor Moon! You said nothing bad would happen! Damn it!